There are currently many anime that end in “-gatari”, but I had personally never seen one. 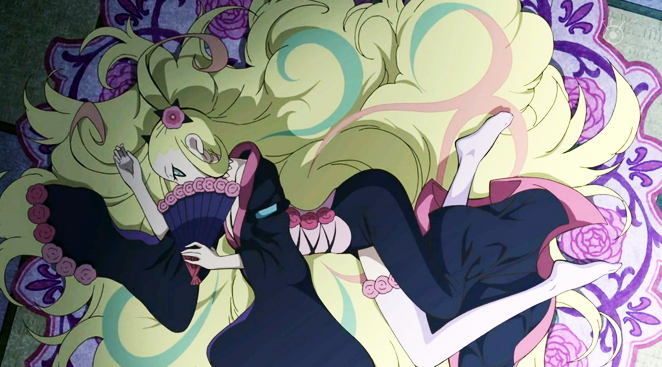 Well, wanting to see one, my friend Rasean introduced me to one he heard had been pretty good, Katanagatari. We started off watching that anime together and eventually stopped since Destiny got in the way (damn that game is good), but I was so ensnared by the anime I wanted to see it to its end, and so I did. 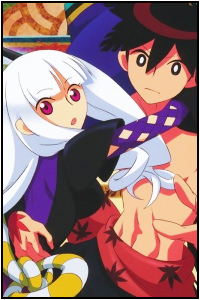 This review is going to tell you what I thought about Katanagatari and what it had to offer. Was this anime a good recommendation all the way to its end? Or was this just something I wanted to finish since I had already gotten most of the way through it? You can find out after the jump! What is This Anime About? Yasuri Shichika lives on a deserted island with his big sister, Nanami. This has been their everyday life for sometime now and they seem quite content with the way that things are. However, Yasuri will soon find that peaceful life he is used to is about to change. One day he is visited by a Togame, a woman claiming to be the strategist for the shogunate. She says that she needs his power as the 7th generation head of the swordless swordsman style known as “Kotouryuu”in order to do something that her predecessors could not, unify all 12 perfected deviant blades by the legendary swordsmith, Shikizaki Kiki. After falling for her, Shichika agrees to be her sword and they embark upon a quest to defeat the users of all 12 swords to realize her objective. Katanagatari is an easy enough anime to follow starting off within the first few episodes as there is only so much to pay attention to. Yasuri Shichika lives upon an island with his elder sister, Nanami. Shichika is the 7th generation head of a martial arts style which transform the user into a “swordless” swordsman, or rather they become swords themselves. Togame needs his strength to take on the 12 users who carry Shikizaki Kiki’s deviant blades, incredibly swords which carry untold power. After ultimately making Shichika fall for her, Togame leaves the island with him to set out on a journey to do what no one else in previous shogunates were able to accomplish. Things begin to get convoluted as we are introduced with various different aspects of character development that tie directly to the central plot of this story. Exactly who is Togame and what drives her ambition to collect these swords for the Shogunate? Who exactly was Shikizaki Kiki and why did he make the perfected deviant blades in the first place? Why does Shichika refer to himself as a “sword” and exhibits no emotions except for the willingness to follow Togame’s order as absolute law? So many things will have to be analyzed as they are made available because they impact the reasoning behind why things are unfolding the way that they are. With that said, this anime does have some very slow times in it. While the big highlight of this series initially is the fighting and action, we will later come to appreciate all the slow parts as we head into the final episode. With that being said, some anime like Soul Eater can feel lessened in their impact because of the way that the story ends, however, when you have an ending like what is present within Katanagatari, it can turn a seemingly horrible episode into one of the most epic endings in an anime to date. Katanagatari is one of those anime where you will ultimately question the story of the anime after finding out what the true plot is. By no means is this a bad story whatsoever, but this anime feels somewhat “empty” because of the circumstances and true agenda that is revealed close to the end of its 12 episode run. Of course, this feeling of emptiness is only really made present if you invest a lot of time thinking about the outcome and the actions taken to get to the conclusion of this story. With that said however, nothing is truly “empty” because the main lesson that the plot aims to teach is made readily available in the final episode and becomes increasingly apparent as the episode progresses, even the ending only enforces said lesson. Ultimately, this story was a bit masterful. It forces the viewer to think more about the lesson at the end than the “why” of how things turned out how they did. It may be a bit hard to understand now, but eventually you will come to grips that nothing in this anime truly matters except what is happening at that point-and-time, an exact reflection of how most should go about living their lives. Beautifully done in its execution, Katanagatari sums itself up quite well. Nearly every character in Katanagatari seems to have a motive or principle as to why they are doing things the way they are, which means we are able to easily be drawn to characters whether-or-not they are considered “good” or “evil”. Though, it seems that most characters are not really experiencing a ton of development from actions that are currently happening, they seem more-or-less the same throughout the entirety of the series (with the exception of Shichika). However, as things begin to come to a head we understand the motives as to why they are who they are, this adds depth without changing the core of the character’s personality. I was highly intrigued by this concept because most series has a character radically change from the beginning of the series to the end of it, having massive jumps in character personality so that they are merely stronger than their previous selves from the very beginning. Our main protagonists are Togame and Shichika, nothing really changed about their personalities throughout the course of the anime except that they were much less willing to kill for their objective. However, this could be argued as many core traits within them did change and that is why they begin to attempt other methods rather than outright kill who was in their way; but this could really be traced back to Togame’s way of thinking and not Shichika. Shichika would do anything that Togame asked, nearly unquestionably, while this changing someways through the series he will never disobey a direct order. During some moment of self-actualization he began to explain his will and strength as a human-being, but ultimately he only does what Togame asks of him in one way or another. I liked how the protagonists did change in very small, minute ways while retaining their personalities, I think this is a better reflection of what would happen in reality than in a fictional work, making it more believable. Other characters within their series have their own resolves, motives, beliefs, etc. This comes through by everyone willing to sacrifice whatever it is for the sake of their cause, making their efforts just as valiant as our protagonists. Something I have to sit back and think about though, is what makes Togame’s and Shichika’s cause more noble than the person whom they are fighting with? There are times where they have finished off enemies who may have a better reason for holding onto the perfected deviant blades than our protagonists, yet they do not care for that reason in the end. Having characters whom you can identify and feel for, even though they are going against those whom you are following along with, makes for one impressive conflict of emotions and makes one really question who is really “right”? Ultimately the development goes pretty well within this series for everyone involved. During the finale episode, if you pay really close attention to the ending, there are obvious impressions left upon our characters from those whom they encountered. While nothing is really said about it, changes within their attire can point to whom they are remembering going forward. STRENGTHS – Amazing final episode, Awesome character designs, Good fight choreography, Teaches a valuable life’s lesson, An insane plot twist, Complex character personalities. WEAKNESSES – Pacing can be a bit slow even if what is going on is vital to the plot, Story becomes convoluted after sometime, Ending can viewed as controversial, The true plot of the story can make it feel like nothing was accomplished. Katanagatari is a show that I enjoyed immensely, I loved how it ended and I thought the ride getting there was absolutely amazing. However, I do realize that this series has a lot of flaws within itself (as far as the true plot), and the ending can be so controversial to the point where someone would question exactly why did things go as they did… and there is no valid argument against that. Perspective on this one matters just as much as understanding why things happened as they did, one might even have hated the ending because they felt everything was for nothing and that some of the tragedies that took place did not have to. To be fairly honest, both sides are correct. This is an anime that really made me think, that realized bits and pieces of what they meant throughout the entirety of the series and brought everything to fruition during the 12th and final episode. 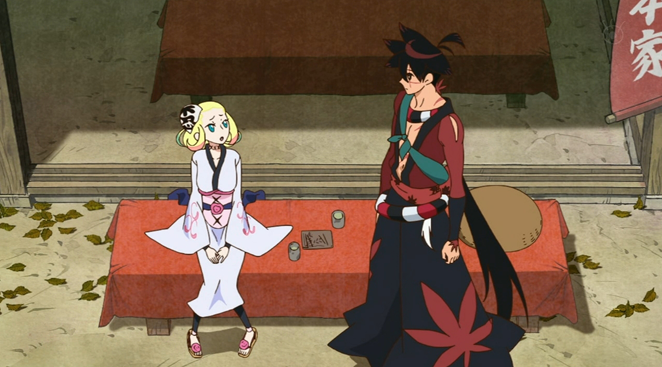 Many anime out there I have seen have not did justice to their series during its final hour, but Katanagatari developed amazingly, done brilliantly in such a way that I have not very seen many anime outside of it that have performed so well. All of the boring pieces of relationship building and character development that seemed mundane and pointless are made to be appreciated, Shichika is made into a true badass, and the lesson the story conveys comes off crystal clear to the point I had questioned decisions I made in my own life. It was just that well done. Even though I gave this series a “Half-and-Half” for what can be inferred from it, I think everyone should go and give it a watch and decide for yourself. For better or for worse, I do not think that this is going to be a series you want to pass on. Katanagatari is the #1 anime of all time for me, down to the art styling, the fighting, and the ever growing complexity of the plot, all for it to wrap up at the end in a surprisingly wholesome finish that leaves a warm impression of the viewer. It’s a 10 from me.